If you are travelling to Inverness by bus, train or plane you should aim to arrive in Inverness by mid- afternoon on Saturday (i.e. Wednesday for the Easter Retreat, and Monday for the Hypnosis week), in good time to catch the Westerbus, which leaves Inverness bus station for Gairloch at 5.20 pm and reaches the Dundonnell Hotel at about 6.50pm, where we will arrange to pick you up. As our courses finish after breakfast on Saturday (Wednesday or Monday) and you need time for the walk and the trip back to Inverness it is best to book your return journey from Inverness after mid-afternoon. 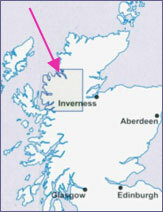 The Westerbus for Inverness leaves from the Dundonnell Hotel at about 8.50am. If you are coming for a personal retreat and you do not have your own transport you will need to arrange to be picked up by us at the Dundonnell Hotel. Note that the Westerbus only runs on Mondays, Wednesdays and Saturdays, in both directions, at the times given above. If these days are inconvenient we may be able to pick you up at Braemore Junction, which can be reached daily except Sunday by Citylink bus Inverness-Ullapool. If you are travelling by car, take the A9 past Inverness over the Kessock bridge. At the roundabout half way across the Black Isle turn left into the A835 signposted for Ullapool. 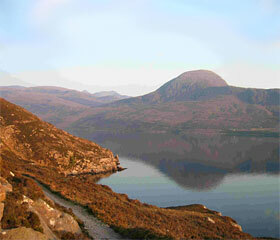 Follow this road past Loch Garve and Loch Glascarnoch to Braemore Junction, which is just 12 miles before Ullapool. At Braemore Junction turn left into the A832 signposted for Gairloch. Turn right off the A832 just before Dundonnell, after passing the Stepping Stone craft shop on your right, and follow the single track road to Badrallach (8.5 miles). Park your car in the parking space at the very end of this road. Take the footpath that leads off from the parking area and is marked by the sign saying "unsuitable for vehicles". The walk to Shanti Griha is three miles and will take you about an hour. Shanti Griha is the third house on your right, well hidden in a large, mature garden. The path leading up to our garden gate begins at a green post marked "Shanti Griha". You have gone too far if you reach a little grass-roofed stone cottage. We expect you to arrive any time between noon and dinner, which is at about 8pm on this first Saturday. The last filling station after Inverness is at Contin, but there is also one at the Dundonnell Hotel, a short distance after the turnoff to Badrallach. There is a phone box at Braemore Junction and one at Badrallach. Pack your belongings in a large rucksack and use plastic bags inside in case you get wet on the walk. Waterproofs and sturdy footwear are recommended, and slippers, socks or sandals for indoors, where shoes are not allowed. A small rucksack and a water bottle are useful for hiking around the peninsula. 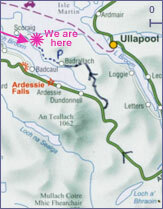 Note that there are no shops on Scoraig. Looking forward to having you stay with us at Shanti Griha!